The best thing I love about blogging on food for all these years is the people I meet via my blog and new recipes I learn from them. I could have probably learned them from other websites, some youtube video or even a cookbook. All of them excellent sources. But when I hear it from a real person it is very different. It makes it more tangible, more real for me. I feel humbled that they share their precious recipe with me. Something probably handed down through generations or something they invented or something shared by their friends. That the recipe found a way to my kitchen from theirs, touched with all their love and turmeric makes it more precious. I have been honored to have Rituporna's Chitol Maacher Muithya, Somnath's Raastar Ghugni, Indrani Bhattacharya's Kumro Begun Chingri, Ahona's Methi Maachh, Sunetra's Piyaajkoli Macch, Piya and Chandrani's Dhonepata Bata Sheem on my blog. Hena and her husband owned a motel in a VERY small town called Hot Springs (2 hour drive from our town). She is a home maker and mother of two boys (11 and 6). They moved to SD from LA 8 years ago. They have sold their motels (to a Gujrati family) a couple of months ago and are getting ready to leave SD. 2. You are from Bangladesh. Do you still hold on to the food culture you had grown up with ? Assuming you are in the US, how do you do that? 3.Bengalis have huge respect for the cuisine from East Bengal. What do you think makes such an impression? I know our friends from Poshchim Bongo love our meat preparation (kabab, kosha mangsho, korma etc.) But do you think our fish preparation is better than yours? My observation is the Bengalis from Poshcim Bongo cook the best Niramish in the sub-continent. We, the bangals, eat meat regularly and that gives us a wider comfort zone as far as the meat preparation is concerned. Cooking meat here is not difficult at all. According to my mother, desi spices which are available here are much better (she probably meant less bhejaal) than their counterparts back home. 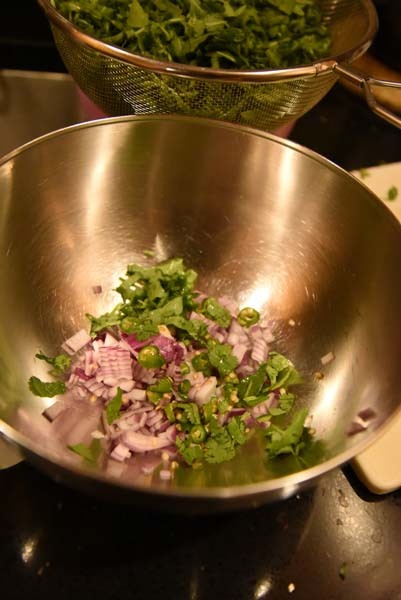 Here is how I make my chicken tikka kabab (see the photo below). I must confess that cooking vegetables in desi style in an area where I live needs a lot of creativity. During the ninety’s and last decade Broccoli was the magic vegetable. We tried to eat Broccoli at least once a week and I got tired of boiled broc (sometimes raw brocs). I experimented for sometimes and now cook broccoli in the following ways. 1. Stir fry it with kalo jeerey and dry red chili phoron. 2. Peel the fat stems, cut them into match sticks and cook with shrimp and tomato. 3. Steam sliced broccoli florets on a pan and make bhorta. I have a family recipe of ‘mishti kumro cooked with moong daal and narkel doodh’. Mishti Kumro is not available here. I replace it with acorn squash (I buy fresh and tender acorn from the farmer’s market in summer). I use the bideshi vegetables but use desi spices and style to cook my vegetables. Here is another photo. 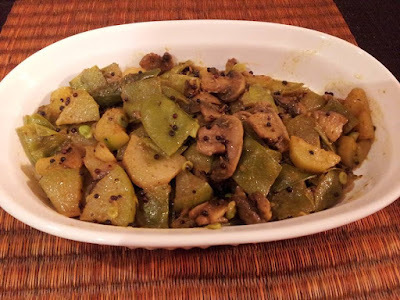 Mushroom, zuchini, potato, snow peas and chayote squash cooked with shorshey and kancha lonka phoron. I also used home-made poriyal masala. 5. You introduced me to a lot of greens. Given that you have a love for gardening, do you also grow them ? Which ones are the easiest to grow ? Gardening is my passion. I essentially grow flowers (roses outdoor and orchids indoor). But I also have a vegetable patch where I grow our desi vegetables (lau, pui shaak, lonka, long and small round begun, etc.) I grow korola and sometimes methi shaak in pots. Desi veges don’t grow very well here as it is very dry but I still try. 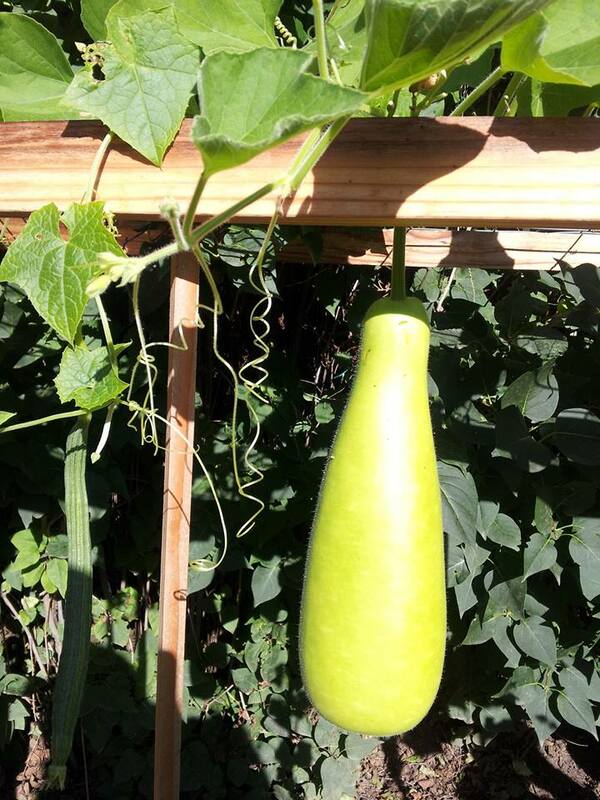 If you are in the East Coast, or in Florida or in California, you can grow any desi vegetable that you want to. I use the methi shaak (that I grow in the pot) for cooking my daal. Lau in my vege patch (photo below). 6. So how do you make this Maacher Bhorta ? 1. Telapia fillet - 2 (depends on the # of people). 2. Smear the fish fillet with pinch of turmeric , dry red chili flakes, salt and garlic powder (optional), and lemon juice, Leave it aside for 20/30 minutes. 3. 2 cups of very finely chop spring salad mix (original recipe says special 'shorshey shaak' available in Sylhet area). 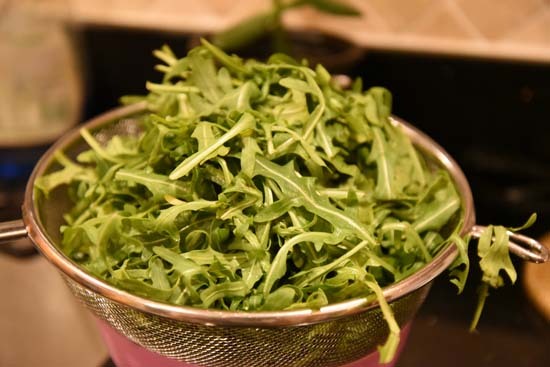 Note:I tried it with arugula and I also stir fried it with garlic, instead of keeping it raw. one tablespoon of finely chopped dhoney pata/coriander leaves. 6. When done with frying, break the fish with your hand. Mix all ingredients and add salt to taste.. Sprinkle mustard oil and mix well. Try to mix with your hand. The Sylhetis call it 'lye pata bhorta'. You may skip onion if you don't like it raw. Hasina Di substitutes the mustard greens with organic salad mix. She says, " It became very popular in our home and we are having it almost every week. 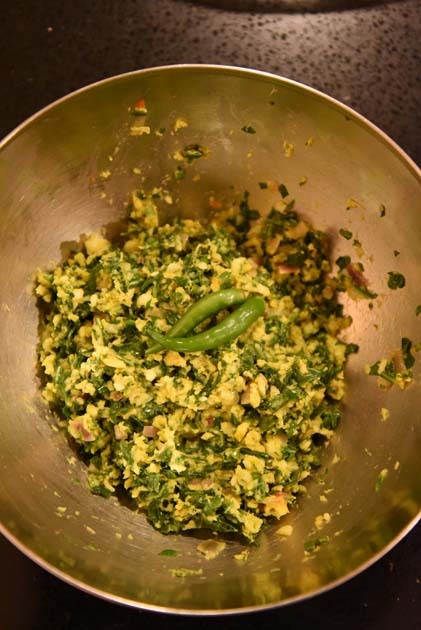 Though it is called bhorta it is more like salad." We too loved this Maachh Shaak er Bhorta. I want to try it with different greens next. Thank you Hasina Di and Hena.